Good quality water is a major environmental, social and economic resource for NSW. When water quality becomes degraded, many of the uses and benefits of this resource may be lost. 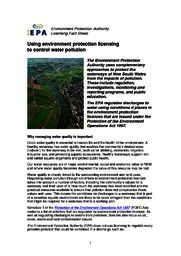 Water is used in a variety of ways in NSW, including for drinking, industrial activities and irrigation, and to preserve the health of the environment. The EPA needs to take all of these uses into consideration when it considers licensing an activity that may impact on a waterway. Schedule 1 of the Protection of the Environment Operations Act 1997 lists a broad range of activities that are regulated by environment protection licences (EPLs). These licences focus on protecting the environment (including human health) and address air, noise, waste and land contamination issues as well as regulating discharges to waters from premises. requiring that pollution control equipment operates properly and efficiently. The EPA does not use licensing to regulate every potential pollutant that could be contained in a discharge or activity. This is because some pollutants are present at such low levels in a discharge that they are highly unlikely to pose a reasonable risk of harm to human health or the environment. Also some activities are are conducted in such a way that discharges to the environment are avoided – such as where an intensive agricultural activity uses an engineered runoff retention basin. The EPA also uses a number of complementary regulatory tools to protect waterways from the impacts of pollution: these include investigations, research, monitoring and reporting programs, and public education.